Swedish football star Zlatan Ibrahimović has launched Myth Bloom for women and Myth Wood for men. 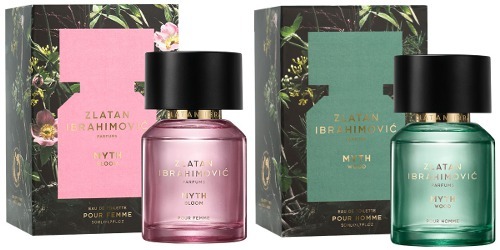 After launching two beloved fragrances, Zlatan Ibrahimović Parfums is releasing its third collection – MYTH WOOD and MYTH BLOOM. The scents capture the elusive magic of Zlatan’s home country – the forests, nature and calm of Sweden. Zlatan worked closely with Olivier Pescheux, one of the world's leading perfumers from Givaudan in Paris. Myth Bloom ~ with wild rose, clover, apple blossom, cedar and blonde woods. Myth Wood ~ with pine, grapefruit, sage, lavender, oak moss and woods. Zlatan Ibrahimović Myth Bloom and Myth Wood are available in 50 ml Eau de Toilette; Myth Wood is also in 100 ml. They can be found now at Colette in France. They do look nice. I never ran into any of his scents anywhere — not even sure they’re in the US at all. It’s really interesting to see a sports star do perfumes that sound so promising. Olivier Pescheux has done many recent Diptyques, as well as two Yves Rochers that I believe I’ve heard commenters mention positively.